Moore's goals for 2019 Dylan Moore talks through his personal and professional goals he wishes to achieve in the upcoming season. Jarryd Roughead may be a beneficiary of the new rule changes in 2019. We've taken a look at who might be the biggest beneficiaries of the new rule interpretations. Clubs must have six players inside both 50m arcs, with one player inside the goal square. Four midfield players must start inside the centre square with the two wingmen stationed along the wing. The AFL has brought this rule in in order to combat the growing trend of clubs placing a ‘spare’ defender in the back half to clog the opposition side’s space in their forward half. Naturally, the likes of Jarryd Roughead and Jack Gunston will be the big beneficiaries of this rule change for the Hawks. So long have these tall forwards battled against the ‘third man in’ at a contest, but this adjustment will see more one-on-one contests for our goalkickers. At kick-ins, a player will no longer need to kick to himself to play on from the goal square. Following a behind, the man on the mark will be brought out to 10m from the top of the goal square, rather than the existing five metres. Since his move to defence, James Sicily has consistently been the club’s kick-in specialist. With his booming right boot coupled with a willingness to hit the more challenging options, this new rule interpretation is tailor-made for the 24-year-old. Don’t be surprised if Sis’ kick-ins are suddenly reaching the centre circle in 2019. When defenders mark or receive a free kick within nine metres of their own goal, the man on the mark will be brought in line with the top of the goal square. One of the most intimidating moments as a full-back must be being pressed up on the last line of defence, ball in hand, few options to deliver to and opposition cheersquad giving unhelpful feedback. If this rule takes even a few degrees out of the heat of those moments then we think Chip will be happy! The player with the ball must be allowed to advance the mark by 50m without the infringing player delaying the game. The player can play on while the 50m penalty is being measured out. A difficult one to judge who will be the biggest winner out of this adaptation for the Hawks, but, going on stats, it’s the reigning Brownlow Medallist who could mount the best case. Only three players in the competition earned more free kicks than Mitchell in the 2018 season, with the ball magnet earning 2.3 per game. 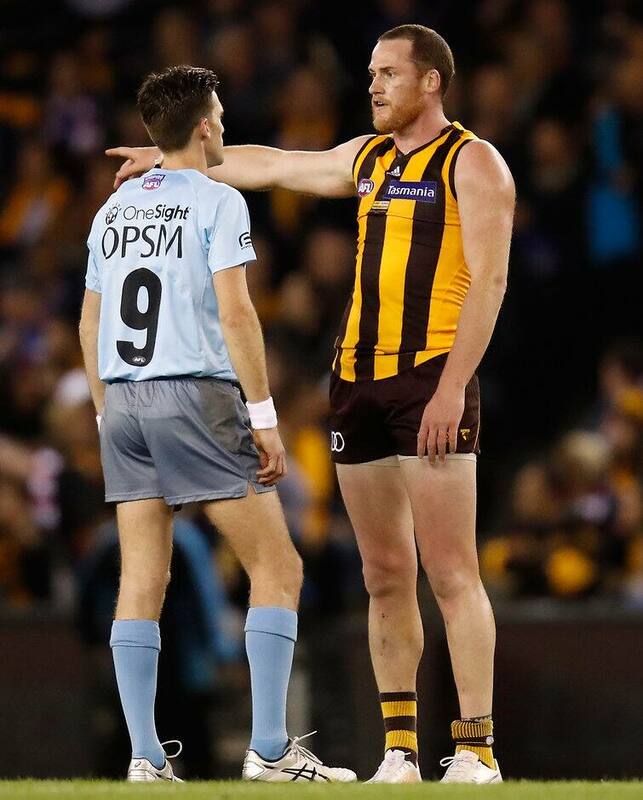 The Hawks number one ruckman, McEvoy will gladly accept this new rule into the book for 2019. Big Boy often outmuscles rival ruckmen in the contest and this change figures to revert back to a bit of a reward for those shows of strength in these battles of the big men.